has a gentle, but enthusiastic manner of guiding her students toward their goals. She began her training at the Marcia Hyland Dance Center when she was 2 years old, and feels that few experiences have been more life- changing for her that the opportunity to discover dance. 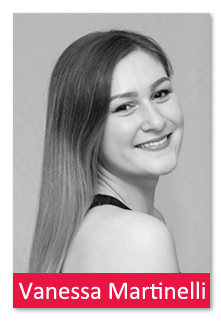 A member of out Dance Company, she shares her years of knowledge with our pre-school and early-grade students who look forward to taking each fun-filled class with their delightful young teacher! Vanessa began dreaming of teaching dance at a very early age, watching her mom Deanna Allen Martinelli (also a Marcia Hyland faculty member) guiding hundreds of students through our technique program. She is presently a sophomore at The College of New Jersey, studying Education in a 5-year Masters Program. Accomplished in many fields of dance, she takes great pride as Choreographer of 2017 productions of “The Lion King”, “Into The Woods”, and “Hairspray” for the Riverfront Community Players. What joy this affectionate teacher receives, realizing that she has helped a child aspire to higher levels. A strong beginning is extremely important, and Vanessa hopes to help her students to focus and reach for the stars!